The University YMCA has been important to Peter Thoreen and Janet Marshall-Thoreen since they first became involved while attending the University of Minnesota. They credit the YMCA for its influence on their values, their careers, and their long and loving marriage. “The Y had a profound impact on me and my future role as a community and business leader, literally changing my life and opening doors that still are opening today,” said Peter, who retired as chief executive officer of St. Luke’s Regional Medical Center in Sioux City, Iowa, in 2015. Peter was drawn to the University YMCA by Project Motivation—a Y mentor program that paired college students with inner-city youth needing another adult in their lives. Jan met Peter on a Y-sponsored Minnesota Boundary Waters canoe trip, and later Jan would participate in Project Motivation, as well. A year after the canoe trip, Jan was searching for housemates to share a rental home. She invited Peter to be her roommate after hearing glowing remarks about his service at the Y from Program Director Howard Bell at a recognition dinner. The rest is history. They were married in 1980 with Rick Jackson, then the executive director of the University Y, presiding over the service. The Y continued to influence Peter and Jan as they built their careers—Jan in speech and language pathology, and Peter in health care administration. “Eight Weeks To Live and Eight Weeks To Die” was a YMCA program that influenced Peter profoundly, both in his role as participant and staff. The program used a simulated terminal illness and role-playing technique that focused on values clarification for 20- to 22-year-old university students. Through this program and others, Peter was exposed to group work and planning, the medical world, and the newly emerging hospice care movement. The hands-on experience and skills would serve him well throughout his 33-year career leading health care institutions across the Midwest. Now retired, Peter and Jan live in Eagan, Minnesota, where they are proud members of the Eagan YMCA. They were also members of the YMCAs in Fargo and Sioux City, where Peter served on the board of directors. Peter and Jan have been sustaining members of the University Y since graduation and first included the University YMCA in their will in 1986. That commitment remains strong to this day. “The YMCA brought us together and we will always support its work—especially the University Y,” Peter said. 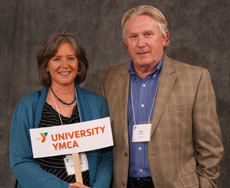 As longtime supporters of the Y, Peter and Jan would love to see the University YMCA alumni network grow and thrive. Through these relationships, the University Y will have a connected community across the generations long after students graduate. Designate the gift to the YMCA of the Greater Twin Cities*, 651 Nicollet Mall Ste. 500, Minneapolis, MN 55402 (Federal Tax ID 45-2563299). Contact YMCA Senior Director of Planned Giving, Jeri Glick-Anderson, at 651-435-6724 or plannedgiving@ymcamn.org for more information or to let us know of your plans. *The YMCA of the Greater Twin Cities is a 501(c)3 nonprofit organization and serves as the legal entity for all YMCA branches and camps.